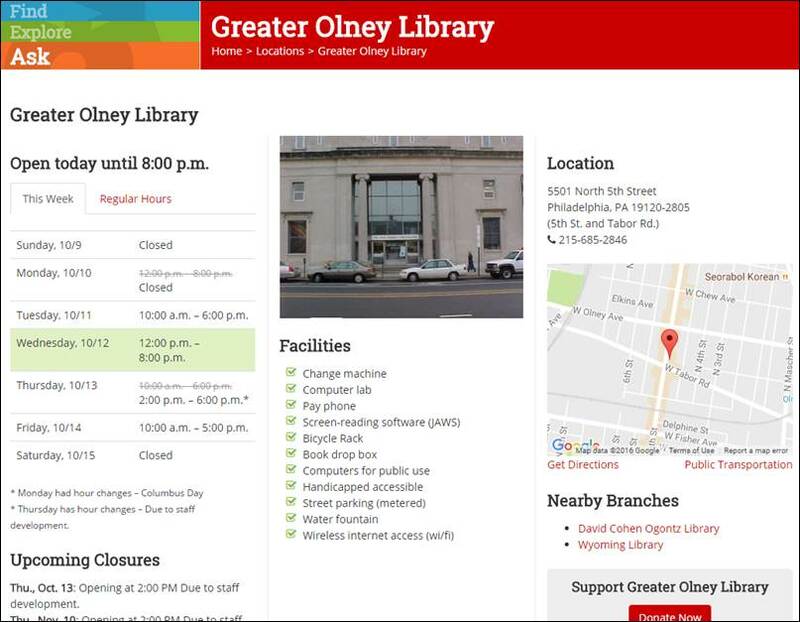 The Free Library of Philadelphia IT Digital Development team has updated the “Find a Location” section of our website today with a new responsive design layout and many new features. 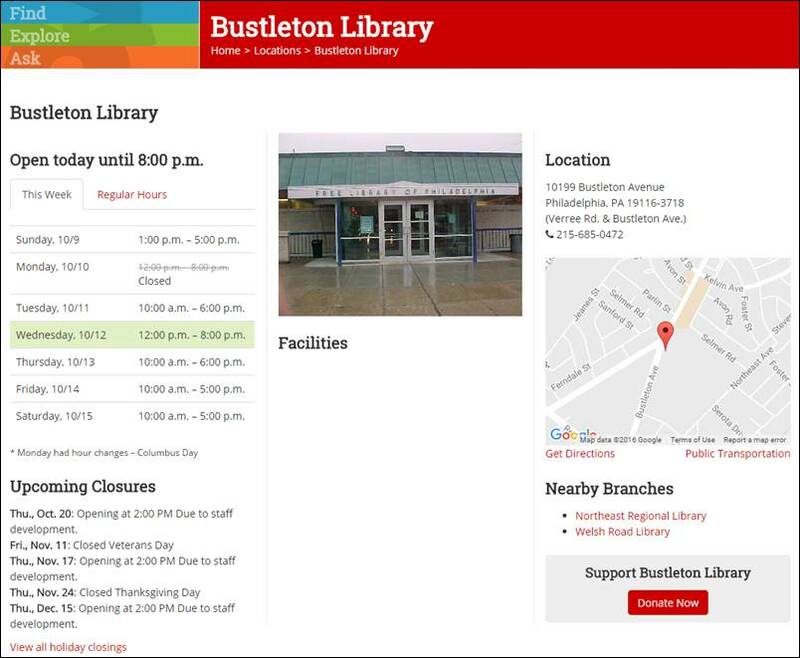 This new section, now named Locations, will make it easier for website visitors to find library location information including Daily Announcements, Renovations and Closings, Real-Time Library Hours Updates, Facilities and Amenities, Calendar of Events integration, enhanced Department pages, and more! 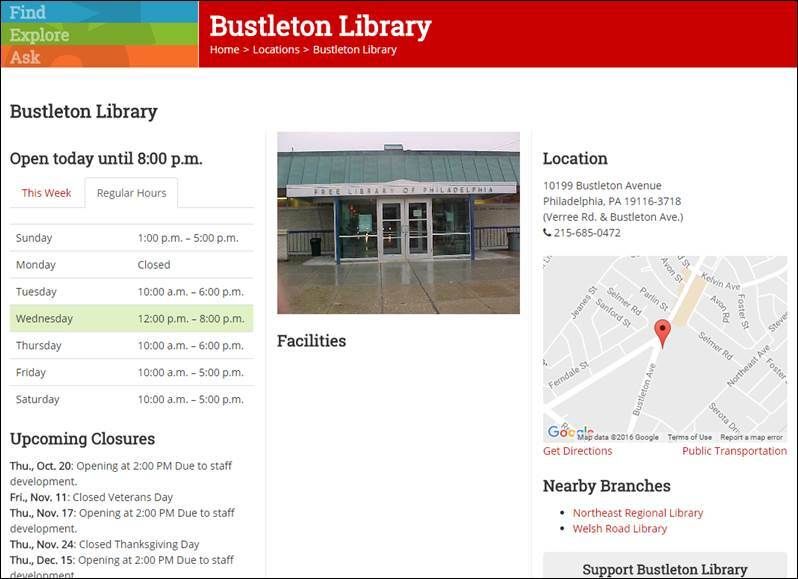 The Locations landing page now displays photos of the libraries, address and phone number, hours open today, and easy to read status messages (e.g. Open Now, Opening in 30 minutes, Closing in 5 minutes, Currently Closed, etc.) 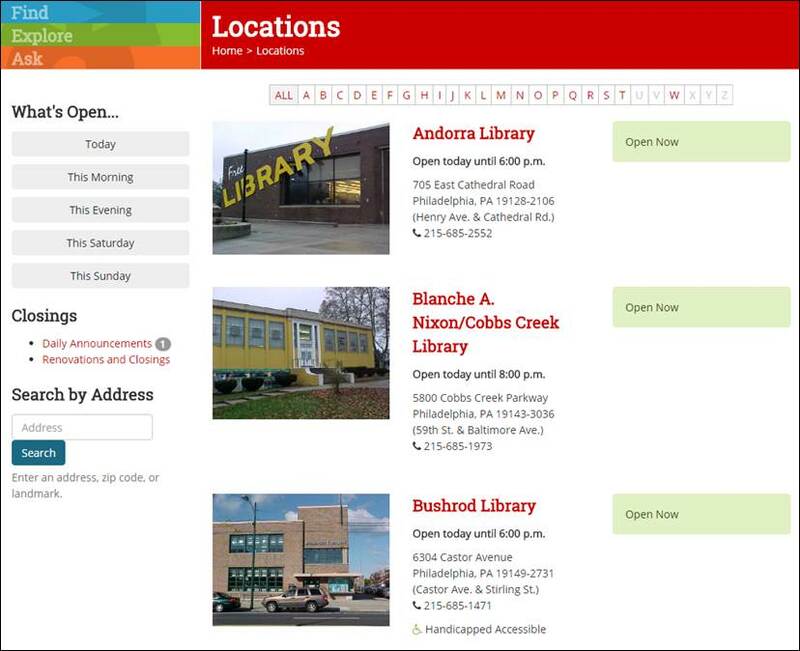 You can also see what libraries are open with the new “What’s Open” menu and sort openings by Today, This Morning, This Evening, This Saturday, and This Sunday. 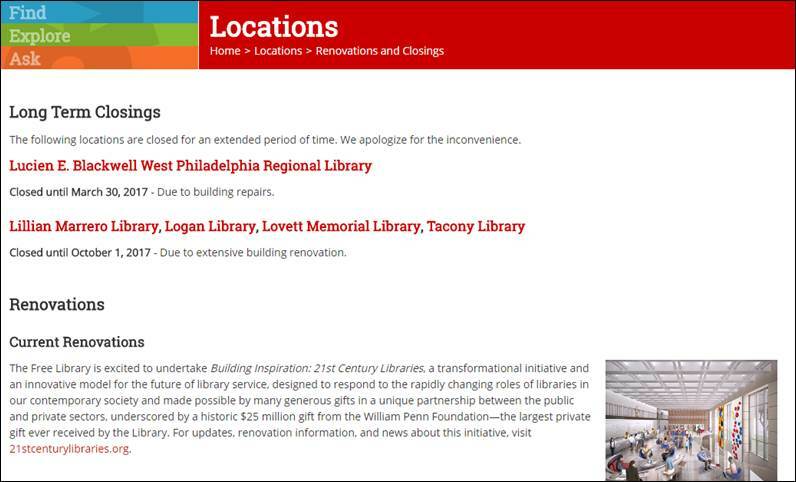 The closing information is now separated into Daily Announcements, a list of all libraries that have unexpected closings or delayed openings for the day, and Renovations and Closings, which lists all our long term closings and renovations projects. 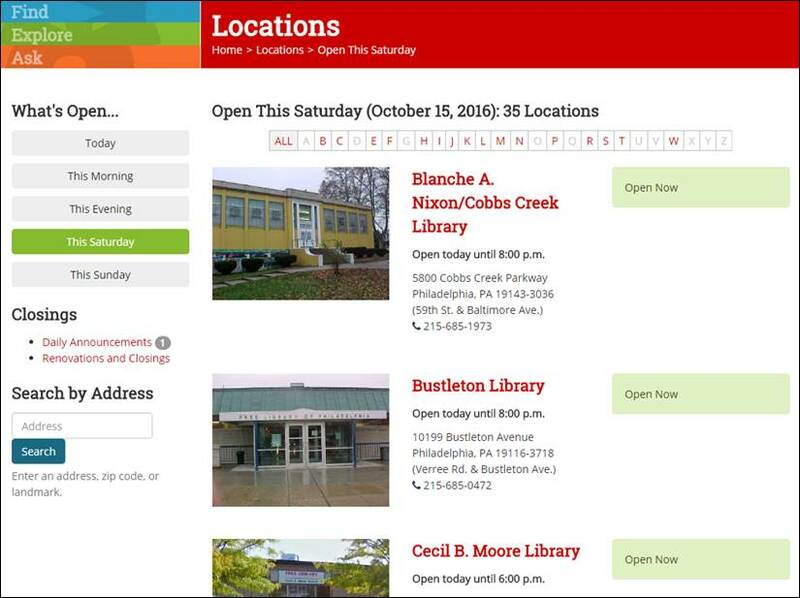 The neighborhood library pages now have a more accurate and easier to read hours menu. 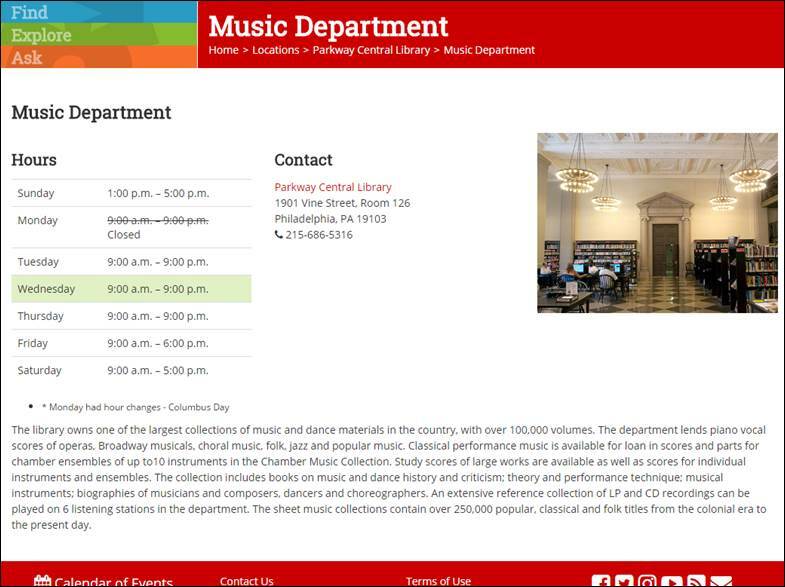 If the library has hour changes, two tabs will appear: This Week and Regular Hours. 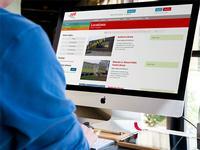 These pages also now display the next 5 upcoming closures (such as holidays and delayed openings). 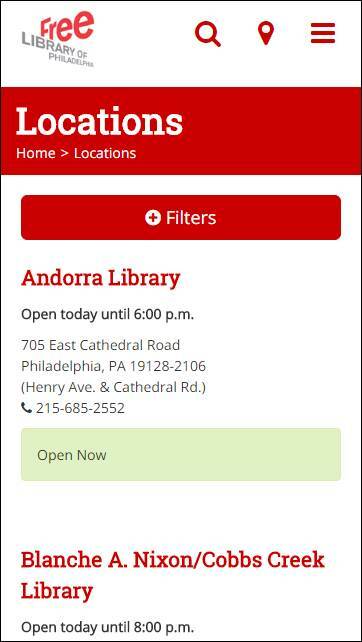 The neighborhood library pages now feature an easily visible list of specific Facilities and Amenities found at that location (e.g. book drop, Wi-Fi, copy machines, bicycle rack, water fountain, etc.). 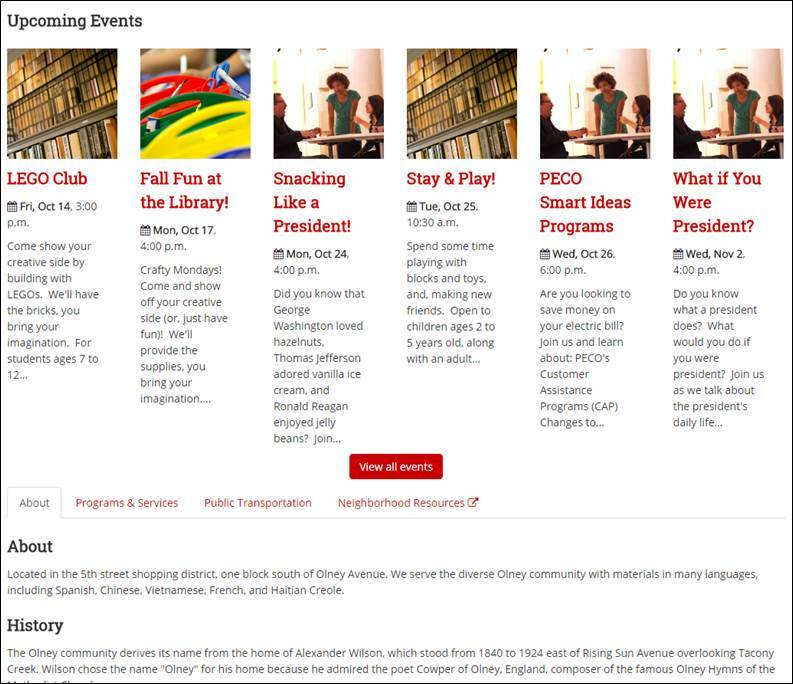 The neighborhood library pages feature our new Calendar of Events layout with larger images. 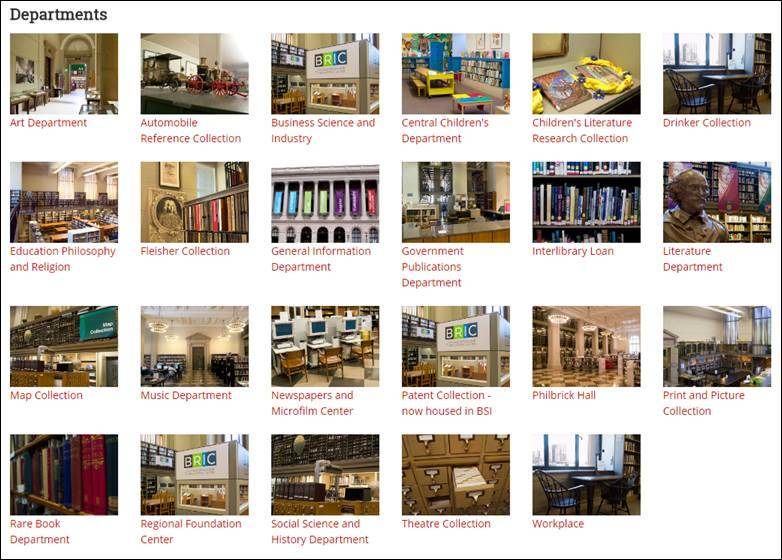 Our Parkway Central Library page now lists all departments with photos, as well as links to new department pages. As always, updates to our website are an on-going process. We are always striving to make our website more user-friendly, encourage exploration, and offer better customer service to our patrons. Please browse and try out these updated sections and let us know what you think in the comments. We always appreciate your feedback! 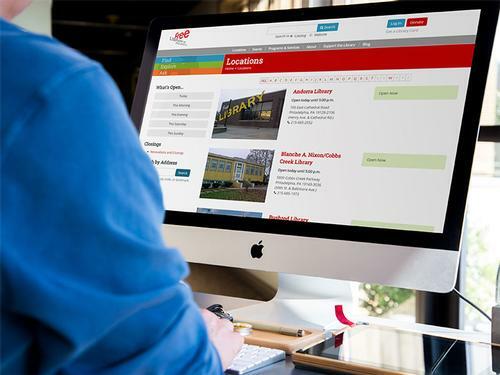 Check Out the New Updates and Features in Our Locations Section! Add a Comment to New Updates and Features in Our Locations Section!